I AM NOT THE COMMON PERSON THAT USUALLY ENTERS IN CONTESTS; BUT I HAVE ENTER ONE!!! I AM ASKING FOR A LITTLE PUSH. IF YOU PERSONALLY KNOW ME, YOU KNOW I AM IN LOVE WITH COOKING, IF YOU HAVE BEEN MY FRIEND, COSTUMER, OR YOU ARE MY FAMILY; YOU HAVE PROBABLY TOLD ME THAT MY FOOD WAS AMAZING, GOOD, PERFECTLY SEASON, etc. IT SHOULD BE ENOUGH FOR ME TO KNOW THAT; BUT I REALLY WANT TO PROVE TO MY SELF THAT I CAN TAKE ON A CHALLENGE LIKE THIS ONE. PLEASE, click on the link bellow, vote 5 times a day, from now until June 13. The Vote Button, will say VOTED after each time you vote, to reset and vote again just update the page, it will let you vote 5 times per day. 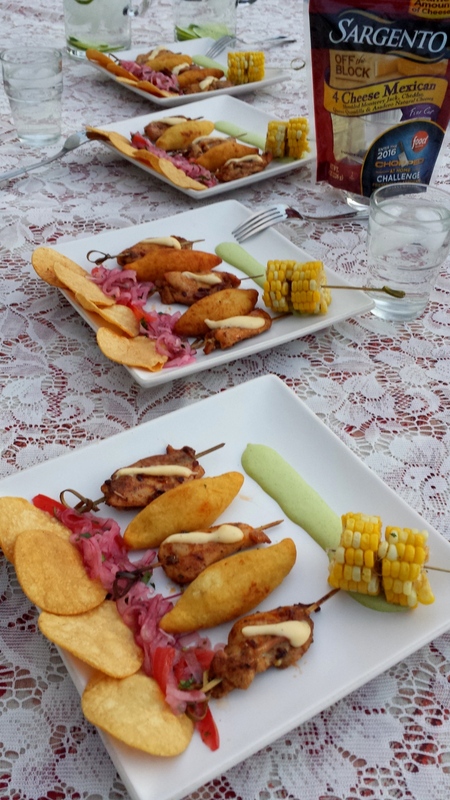 CHICKEN ANTICUCHOS & STUFFED POTATO AND A POBLANO HUANCAYNA SAUCEThe fresh taste of the lime balance the hot taste from the Poblano Huancayna Sauce. A Cheese Fondue drapes over the Chicken Anticucho, just to make it more decadent; while a nice crunchy bite of freshly made tortilla chip seals the deal.